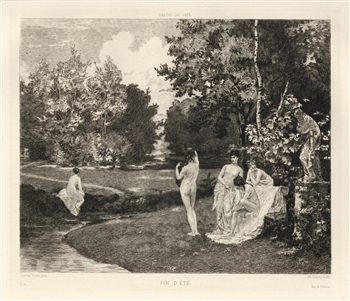 Medium: etching (after the painting). Etched by Charles Courtry after Carolus Duran. This impression on laid paper was printed by A. Salmon and published in Paris for "L'Art" in 1875. The plate size is 8 3/4 x 10 1/4 inches. Not signed. Condition: there are some tears at the bottom of the sheet (well outside the plate).